Ambassador DeTrani was President of the Daniel Morgan Graduate School of National Security and prior to that was the President of the Intelligence and National Security Alliance, a professional Think Tank. From 2003-2006, he was the Special Envoy for Six Party Talks with North Korea and the U.S. Representative to the Korea Energy Development Organization (KEDO). Ambassador DeTrani was then appointed as an Associate Director of National Intelligence and Mission Manager for North Korea. In 2010 he was the Director of National Counter Proliferation Center and Special Adviser to the Director of National Intelligence. 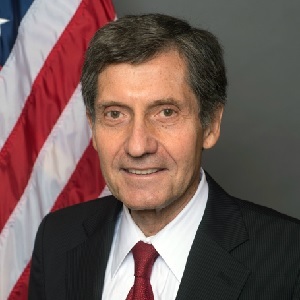 Ambassador DeTrani served over two decades with the Central Intelligence Agency as a member of the Senior Intelligence Service. He was an officer in the Air Force and a distinguished military graduate at New York University (NYU). He attended NYU School of Law and Graduate School of Business Administration. He’s a fluent Mandarin Chinese speaker and a member of the Council on Foreign Relations. He has published extensively on issues related to North Korea, China and nuclear nonproliferation.